Is India Finally Getting Modern Artillery? The army has not bought a new howitzer in 25 years and is desperate to close gaps in long-range, high volume firepower. Yesterday, New Delhi announced that it has successfully tested an upgraded howitzer for use in the Indian Army. “The indigenously designed and manufactured 155mm x 45mm caliber artillery gun, Dhanush, has successfully met all technical parameters during the winter and summer trials,” a press release said. 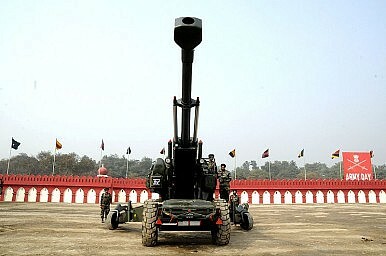 This announcement came somewhat as a surprise since Dhanush howitzer prototypes suffered repeated barrel bursts during firing trials last August and during the winter of 2013, after which India’s state-owned Ordnance Factory Board (OFB) had to change the metallurgy of the canon. India’s Defense Minister Manohar Parrikar noted that the Dhanush incorporates many improved features in comparison to the guns which the Army possesses at present. The Dhanush is an improved version of the FH-77B 155 mm/39-caliber towed howitzer manufactured by the Swedish defense contractor Bofors (now BAE Systems) and of which India acquired 410 between 1987 and 1991. The major upgrade of the howitzer is a larger caliber, 45mm compared to 39mm. Additionally, the Dhanush has a new maximum effective range of 38 km in salvo mode compared to the 39-calibre, 27-km range of the original guns, according to local media reports. The howitzer is capable of firing eight rounds per minutes and needs a crew of six to eight artillerymen. The Hindu claims that the howitzer is 80 percent indigenous with only “the APU (auxiliary power unit), electronic dial sights, and [a] few other small items being imported.” However, the modernization of the weapon system is still based on schematics supplied by Bofors/BAE Systems under a technology transfer agreement in the 1980s. The Indian Army has already ordered 114 howitzers, which, given the successful trials, should enter mass production momentarily at the Gun Carriage Factory in Jabalpur district of Madhya Pradesh in central India. The Times of India reports that the army is readying itself for the induction of the first battery of six Dhanush guns this year. The army expects to receive a total number of 414 howitzers. The initial procurement of the Bofors howitzers in the 1980s was steeped in controversy and led to India’s most infamous arms purchase scandal in recent history, which torpedoed all artillery modernization plans. As a consequence, no new artillery has been purchased by the Indian Army ever since, while various other tenders (e.g., for 180 pieces of 155mm/52-caliber wheeled self-propelled guns) also had to be cancelled due to various allegations of corruption. “India’s two towed howitzer competitions, and its two self-propelled artillery procurements, have mostly served as cautionary tales. If the stakes weren’t so high, they’d qualify as farce,” Defense Industry Daily said back in November 2014, summarizing India’s recent botched artillery procurement history. It still remains unclear whether the Dhanush gun genuinely fulfills all service requirements, according to Defense News. However, “[t]he Army is desperate to acquire the weapon as it has not been able to buy a single howitzer since 1987, despite a 1999 long-term plan to convert all existing artillery guns to 155mm/52 caliber at a cost of more than $6 billion,” Defense News emphasizes. The Indian army’s 1999 Field Artillery Rationalization Plan aimed to acquire 2,800-3,000 155 mm/52-calibre guns of all kinds and 155 mm/39-calibre lightweight howitzers by 2027. At the moment the military has merely around 200 guns in service, despite the known utility of artillery as illustrated by the 1999 Kargil War.